HYDMECH H-Series of horizontal metal cutting band saws are guillotine saws that deliver straight cuts every time. Primarily designed with high production multi-shift environments, they are tough and durable machines capable of cutting solids, tubing, channels, angles, stainless, non-ferrous, hi temp alloys and many other types of metal cutting application purposes. This is an ideal band saw for completing multiple slugging of parts and will handle the demands of steel fabricators, metalworking machine shops and metal service centers. 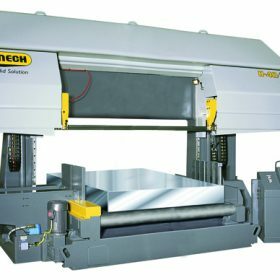 FABTECH SOLUTIONS offers a complete line of Metal Cutting Horizontal Band Saws for sale. 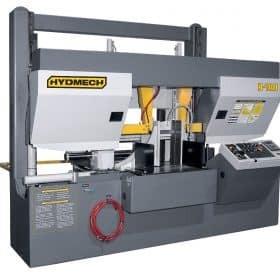 HYDMECH’s H-11A Automatic Horizontal Band Saw has the smallest footprint of the automatic horizontal band saw series and will still provide the best value and lowest cost per cut in any metal fabrication shop. Utilizing a hydraulic positive down feed control that monitors both rate and force, this band saw features an 11″ x 13″ capacity and a 6 HP VFD motor. The most reliable choice for your horizontal metal cutting applications. 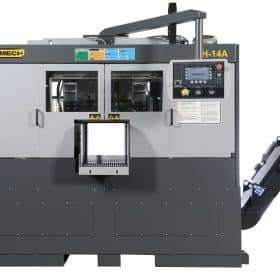 HYDMECH’s H-14A Automatic Horizontal Band Saw comes specially equipped with a carbide tipped blade and will out perform anything in it’s class. This is a fully automatic band saw with hydraulic full stroke vises. With a 1 ¼” blade and 14” x 14” capacity, the ideal band saw for all your metal cutting needs. HYDMECH’s H-18A Automatic Horizontal Band Saw cuts fast, with its high speed shuttle feed indexing up to 34″ in a single movement. Its standard split front vise delivers a short material remnant length, reducing material waste. The hydraulic full stroke vises and split front vise reduces remnant pieces to only 4″ (100mm) without bundling. This band saw features an 18″ x 18″ capacity, 10 HP motor, and 1 1/2″ blade, the H-18A is a reliable choice for all your horizontal metal cutting applications. 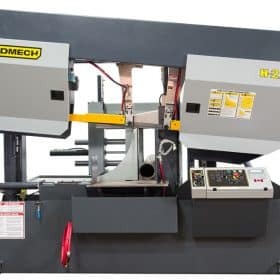 HYDMECH’s H-22A Automatic Horizontal Band Saw allows for accurate 90° metal cutting for use in heavy-duty applications. This is a highly versatile, guillotine style band saw designed to provide exceptional, straight cutting capability in multi-shift, high production environments. A fully-automatic metal cutting saw with hydraulic full stroke vise, canted head, 10 HP motor, and 2″ blade and makes it an ideal solution for every metal fabrication shop. 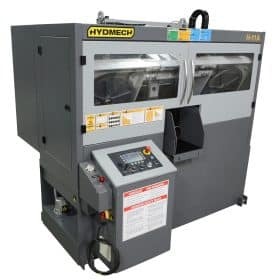 HYDMECH’s H-40/80 Horizontal Band Saw is a heavy-duty semi-automatic saw with a solid head frame and base design complimented by a powerful blade drive system. The replaceable carbide insert guides housed in two heavy duty cast iron guide arms provide a superb cut accuracy and excellent vibration dampening. This bandsaw is a reliable choice for all your heavy-duty horizontal metal cutting applications. Our expert team of factory-trained service engineers can discuss machine tool repair options with you today, we can effectively minimize your downtime and keep your manufacturing process running smoothly. Look into one of our maintenance contracts to ensure quality and optimal service for all your machine fabrication needs.